It's Facebook Fridays! for January 19, 2018, and we hope to help you bathe your way to a healthier, happier you! The Lucky Mojo Curio Company is holding a random drawing to give away 5 cleansing and healing spiritual supply prizes to our friends and followers on Facebook. 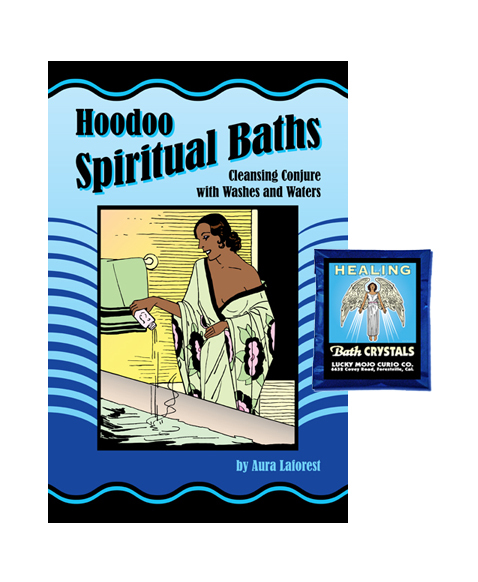 This week each lucky winner will receive a copy of Aura Laforest's beloved "Hoodoo Spiritual Baths: Cleansing Conjure with Washes and Waters," a clear, concise, and authentic guide and recipe-book that catalogues more than 100 African-American bathing techniques employed in matters of luck, love, money, health, and protection -- plus a packet of hand-made Lucky Mojo brand Healing Bath Crystals for use on the body, in the laundry, or as a room-cleaning floor wash.
First thing tomorrow morning, we will select FIVE winners at random, announce their names here, and ask them to message this Facebook Page with their mailing addresses, so we can send them their FREE Hoodoo Spiritual Bathing products. We have a winner! In fact, we have 5 lucky winners! Our Facebook Fridays! winners for January 19, 2018 are: Matt Wilson, Shannon Del Fiorentino-McLeran, Paul Shin, Miki Candice Yamada, and Russell Jerome Coleman-Jackson.